The heart of the Seattle waterfront, the Pike Place Market is a colorful, bustling place with tons of charm. Many photo shoots have been held in front of the iconic red signs, and I've personally tried to re-create some classic scenes. I also like the cobblestoned Post Alley and the green Victor Steinbreuck Park, which are excellent spots for couples' engagement and wedding photos, family portraits, and even professional headshots. Couple's engagement photo session at Pike Place Market. Taken at nighttime around the holiday season. I love how the lights cast a bright sheen on the wet cobblestones. Time stops when I kiss you. Kate and John moved to the South shortly after their engagement and wanted to do a photo shoot at their favorite spots in Seattle. For this photo, we tried to re-create Robert Doisneau's famous Kiss by the Hotel de Ville. Kelsey wanted photos for her high school yearbook. This picture was taken in an alleyway near the Pike Place Market. Glitter Girl: This may not make it into Kelsey's yearbook, but it was a sunny day, and I just happened to have some fairy dust with me! Hailing from Oklahoma, Cassidy and Justin love exploring Seattle and the Northwest. 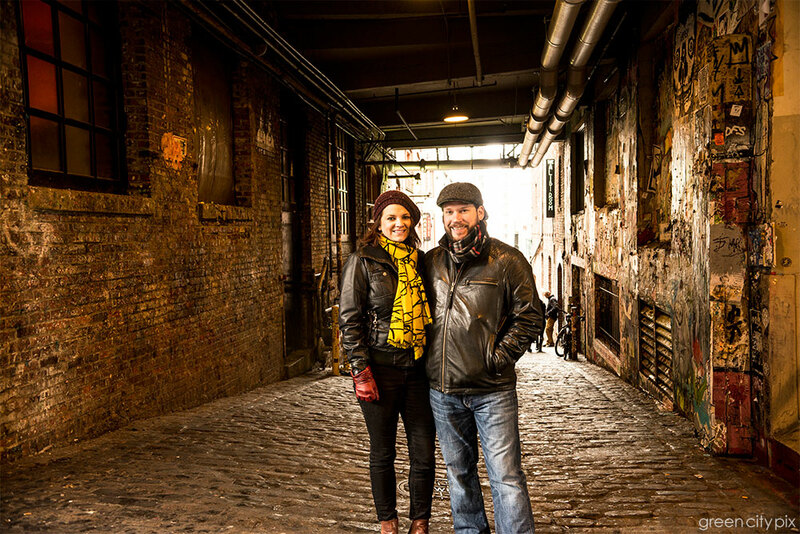 The Post Alley's red and brown tones made a warm backdrop for this couple's engagement photo. Things look brighter when I'm with you. I love making photos of people's silhouettes, and the backlight at Post Alley provided a striking contrast. The Pike Place Market is also a great place for a professional headshot. Prateek, who is from London, needed some business portraits for a University of Washington website and his LinkedIn profile. During the course of our photo session, I learned that this man had been trained in ballet, so I asked him to jump for me. The other guys just happened to walk by for this serendipitous moment. Stand out from the crowd. Photo taken at Victor Steinbreuck Park, a few steps away from the Pike Place Market.